The condition Labrador Hip dysplasia is a generic disease and one that frightens most Lab owners to death. In it’s most severe form it can cause crippling lameness and lead to severe arthritic pain in the joints. The disease has been exhaustively studied by vets and scientists but to date it has been impossible to eradicate the problem in Labradors. Labrador Retriever puppy dog hip dysplasia. The left hip (positioned on the right side in the X-ray) is worse than the right hip, with only slight coverage of the head of the femur by the acetabulum. The disease can occur in Labs that are just a few months old or it can strike later in the dogs life. I suppose it is this unpredictability that frightens most Lab owners. There are a number of factors which will combine to cause the disease in Lab including its generic make-up, i.e., if the dogs parents and grand-parents suffered from the disease and other factors which could include diet and being over-weight. Although no-one can really predict when or if the disease will strike there are some tell-tale signs which can lead an owner to suspect Labrador Hip Dysplasia in his dog. If your Lab begins to show signs of stiffness or soreness after exercise; or if he is suddenly begins to become reluctant to run or play then these may be signs of concern. Similarly, if your Labrador shows lameness or is unwilling to jump up or even run up stairs; these are all signs of the diseases presence. More obvious things to look out for include visible dislocation of the hip and a reduction of muscle in the same area. If any of these symptoms are present, or if the owner has any concerns whatsoever, please take your Lab to the vet immediately. If the disease develops without treatment the dog will be in great pain and will eventually be unable to walk. One thing to remember is that all Labs are different. They have different temperaments, different pain thresholds and different bodies. Some Labs may be able to cope with the pain and discomfort for a long time before becoming obviously effected so owners must be constantly on their guard. 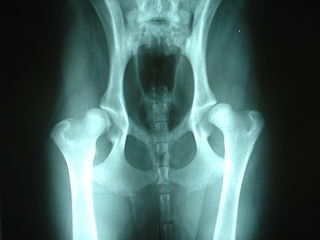 Unsurprisingly x-rays are the best way to discover Labrador Hip Dysplasia in a dog but, with the disease being largely inherited, hip scoring tests should also be carried out. Certainly when you are looking to purchase a Labrador puppy you must insist on seeing the hip scores of both parents. Don’t just look at the fathers hip score. A puppy from litter sired by a male with a perfect hip score can still develop the disease if his mother has hip problems. Don’t be caught out; any reputable breeder will show you the hip scores of both parents. An x-ray is taken to allow the vet to evaluate the joints though any visible symptoms as noted above will also be taken into account as quite often an x-ray won’t reveal the full extent of the Labs pain. So the vet will also consider how the dog moves and evidence of lameness before making his prognosis. It may sometimes be necessary to anaesthetise the dog prior to the x-ray as the vet may need to manipulate the hip into different positions to make diagnosis easier. This, however, is very painful for the Lab so using anaesthetics or some other form of sedation is usually required to get the best x-ray results. Although there is no actual cure for Labrador Hip Dysplasia treatment can make the dogs life so much better by reducing pain. Treatment is administered either by medication or surgery. Within this medication section we will also include exercise and weight control. The common consensus of opinion is that controlling a Labs weight is the single most effective thing an owner can do to help with arthritis pain. Together with exercise, which helps to develop cartilage growth, keeping a dogs weight under control arthritic symptoms and this, in conjunction with anti-inflammatory medication, will reduce the pain and discomfort the dog is suffering. There are a number of different drugs available and the vet will often conduct 2-3 week tests to see which is the most effective drug to use in each different case. Anti-inflammatory drugs are generally very safe to use for labs but it is often recommended by vets that the dog should undergo monthly blood tests to ensure he is not suffering a reaction to the medication. In some cases a nutritional supplement (glucosamine based) can naturally help the healing process within the joints. However, vets are split on the question of how effective glucosamine really is, so don’t be surprised if your vet doesn’t recommend a nutritional supplement. Natural supplements such as glucosamine and other minerals may help restore cartilage. Products like PetAlive Muscle & Joint Support are worth researching (click product link for supporting research) and a conversation with your Vet. Surgery is normally only considered in cases of Labrador Hip dysplasia if medication has failed to improve the dogs condition. Remember the object of any treatment is to provide an acceptable quality of life for the Labrador; so, unfortunately, surgery will only be considered when the vet is reasonably certain of success. Surgical intervention will, in most cases, try to repair the damaged hip joints or even replace it. The most successful modification surgery involves reshaping (or possibly replacing) the femur or realigning the hip socket. This procedure though is only suitable for lighter dogs which, in case of Labradors, means only the younger dogs can be treated this way. For older and heavier dogs suffering from Labrador Hip dysplasia the best surgery is a hip replacement. This is a very expensive procedure but is highly successful as it completely replaces the effected joints. The dog becomes mobile once more and there is no chance of the disease reappearing in the replaced joint. For more information download this helpful UC Davis fact sheet on dog hip dysplasia (pdf download). 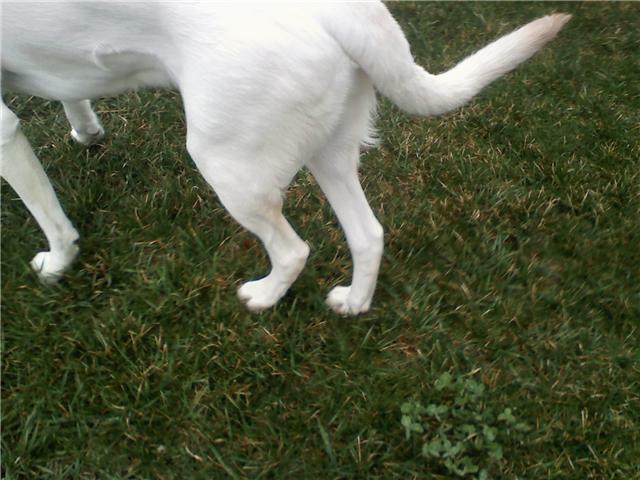 Have A Labrador Hip Dysplasia Question for our Veterinarian? How to see if a one year old lab puppy has hip problems?